Spend Earth Day with the Horses! 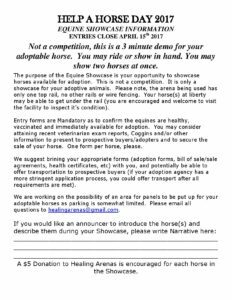 – Healing Arenas, Inc.
Come celebrate Earth Day at Help A Horse Day 2017 ! In honor of our Stable Survivors Veterans Project, see the American Legion Post 74 Honor Guard raise the Flag at 11am! 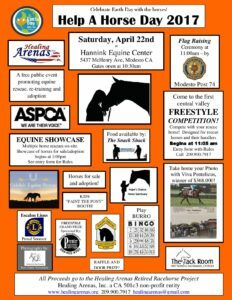 The first ever Freestyle Competition for rescued horses and their handlers at 11:05, followed by an Adoption Showcase at 1:00pm. Bring the kids to the “Paint the Pony” booth, get your picture taken with an ex-racehorse who won almost a million dollars! Play Burro Bingo and visit all the adoptable horses. Visit Hope’s Chance Sanctuary and Oakdale Equine Rescue booths. 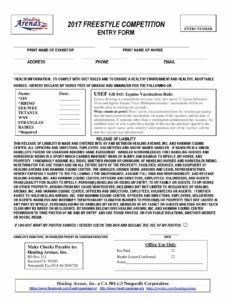 Food available by Crescent Supply’s Snack Shack – see you there! 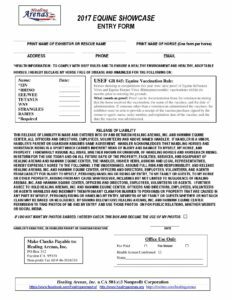 RULES AND ENTRY FORMS BELOW! 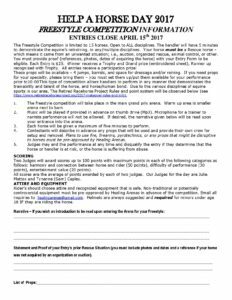 FREESTYLE COMPETITION – Entries close April 15th! ADOPTION SHOWCASE – Entries close April 15th!